Denver Comic Con — fourth time’s a charm! 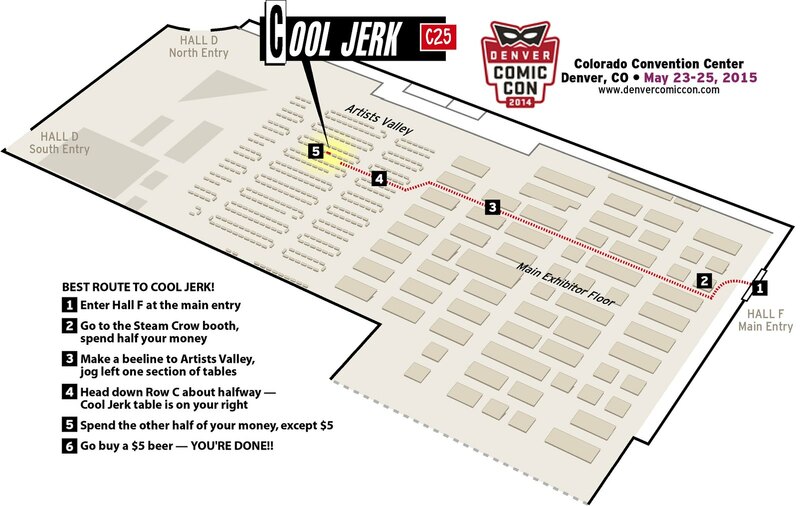 Because they can’t keep me away, Cool Jerk will again be exhibiting at Denver Comic Con this weekend, Saturday-Memorial Day Monday (May 23-25). 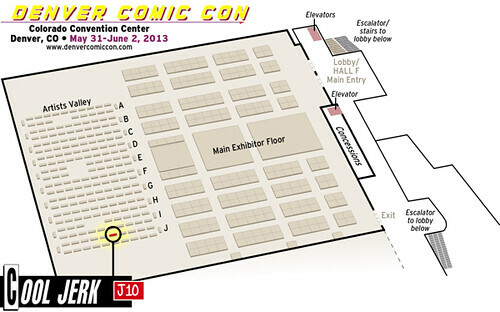 This marks the fourth year in a row for both Denver Comic Con and my exhibiting there! I’m driving out this time, so the Cool Jerk All-Terrain Assault Vehicle™ will be loaded with things not normally seen in Denver, like Cool Jerk T-shirts and original art! Expect crowd-pleasers like my canvas panels, buttons, stickers and enough Cool Jerk and Doc Splatter books to prevent the usual sell-out. My sketches are always free so don’t forget your sketchbook! Here’s a map I whipped up. Come find me at C25 in Artists Valley! Denver Comic Con consistently amazes me with its collective passion and enthusiasm for comics and pop culture. I hope to see you there! That’s right, Mountain-Timers! 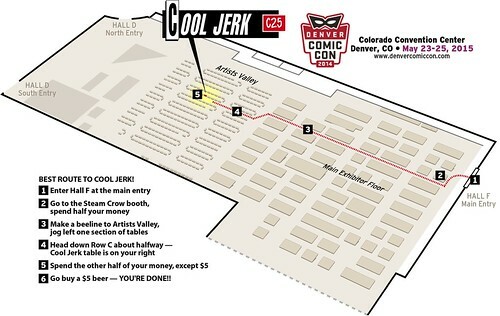 Team Cool Jerk will be in Artists Valley at the second-annual Denver Comic Con, Friday-Sunday (May 31-June 2). I did the show last year and I really enjoyed it. The enthusiasm of the attendees and my fellow exhibitors proved to everyone — especially the organizers of the convention — that Denver embraces comics and pop culture with a passion. I think one of every two attendees last year came in costume (or at least sported apparel adorned with comics, cartoon, fantasy or sci-fi regalia). 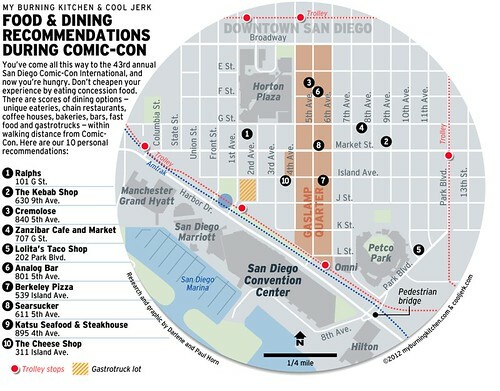 The Comic Con is still held in the Colorado Convention Center, but they moved it from Hall A to Hall F. Maybe next year or in 2015 they’ll open it up to both halls! Like last year, I’ll have all Cool Jerk and Doc Splatter books for sale, along with buttons, stickers and Cool Jerk Canvas Panels. Darlene will be on hand to sign copies of our collaborative comic, The Girl with the Donut Tattoo. I’ll also have a blue-line copy of Thinkulus to whet your appetite (and take advance orders)! Since we’re flying to this convention, we’ll only able to pack along a modest amount of books. Last year I had sell-outs by show’s end, so here’s a PRO TIP: Buy early! If you happen to live within a two-state radius of Denver, please come to the ’con and show Colorado that you support comics culture and their creators (especially independent, self-publishing wackjobs like myself)! We’d love to meet you and sell you some comics and stuff. 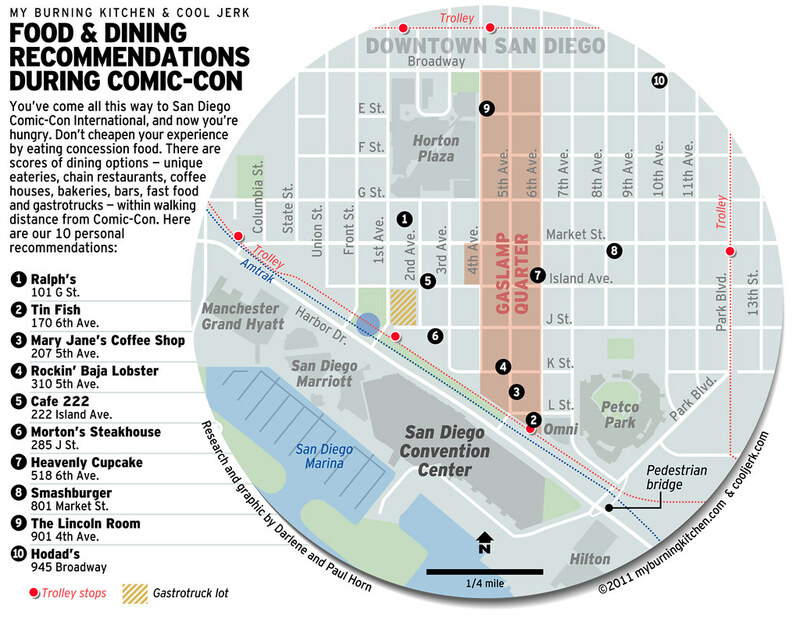 Going to San Diego Comic-Con but don’t want to lug around your Goldie Gold and Action Jack lunchbox? Don’t sweat it — Team Cool Jerk’s got your back. Here’s a handy lil’ map I whipped up for Darlene’s blog. 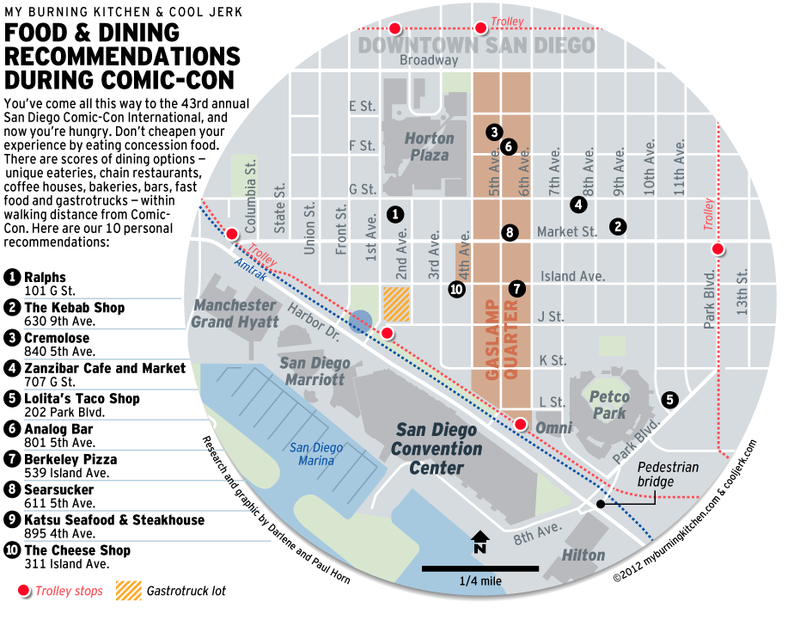 We’ve been meaning to do this for a few years as a public service, especially for our out-of-town friends who sometimes resort to eating concession “food” at exorbitant prices. As for me, I’ll be having only the finest Kobe beef cheeseburgers, topped with foie gras and tapir bacon imported from Malaysia. Mmm… tapir…!